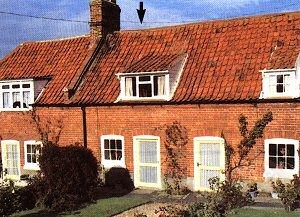 A terraced cottage close to the harbour at the western end of the village, available for self-catering holiday letting. Accessed via short paths there is a small fenced rear garden adjoining a large communal lawn by the rear path. Fitted kitchen with electric oven/hob, fridge freezer, microwave and washing machine; Lounge/diner with CTV, table, chairs and easy chairs and open fireplace; Steep turning staircase to front bedroom with large wardrobe, d. table and 3 single beds: Rear bedroom (2 single beds and large wardrobe) and Bathroom (bath, electric shower, wash basin, WC, heater and airing cupboard) are both accessed from the front bedroom.